The well-preserved Maoshan paddy fields (4700–4300 bp) were built on an intermediate landscape between the foothills and alluvial plain of the Lower Yangtze River. Despite several interdisciplinary research, there has been a lack of detailed environmental and ecological data to contextualise the reconstructed rice farming practices within a wider paleo-environmental background. Our research provides key information on the chronology, vegetation, and long-term hydrological fluctuations at and surrounding the paddy fields. Our 14C and OSL dates show that the initial occupation began at around 5740 ± 140 cal. bp, and the paddy fields were built at around 4675 ± 145 cal. bp and were in use continuously until around 4000 cal. bp. Our pollen, diatom and phytolith data shows that whilst the vegetation in the field was sensitive to changes caused by water management and rice farming, the ecological system surrounding the fields was relatively stable. We suggest that this high frequency of in-field vegetation changes was closely related to intensifying water management for rice farming. This thesis is supported by our geophysical and geochemical analyses of bulk sediments, which shows that the steady build-up of the alluvial sequence was punctuated by several short-term episodes of high-energy surface runoff, including strong flushing in of sandy sediments into the fields perhaps through irrigation activities. Our paleo-ecological and geoarchaeological investigation at Maoshan permits an overview of the development of rice farming and intensifying water management practices in a wider environmental context and offers significant insights to the ongoing debate on the wet-dry dichotomy of early rice farming. The Lower Yangtze River is one of the key areas where rice was consumed from the beginning of the Holocene and subsequently domesticated (Fuller et al. 2009; Liu et al. 2007). During the protracted cultivation and domestication process, prehistoric communities first managed and modified natural habitats of wild rice for the initial cultivation of rice (Zong et al. 2007) and later constructed man-made paddy fields for increasingly large-scale rice farming (Ding 2004). The construction of paddy fields was also accompanied by increasing ecological intervention and biological modification in the fields. A recent research trend is to apply palaeo-ecological approaches to investigate water management strategies and the ecology of rice farming in the Lower Yangtze River. For instance, through their detailed examination of phytolith assemblages collected from a number of ancient and modern rice farming sites, Weisskopf et al. (2015) investigate the long-term fluctuations of water conditions in rice fields and the evolution of rice farming system in the Lower Yangtze River. They suggest that the paddy fields at Caoxieshan (6000–5800 bp) were dominated by dry species, corresponding to an emphasis on drainage in the fields. A return to wetter conditions in the paddy fields at Maoshan was indicated by evidence for a ‘highly irrigated paddy systems’ (Weisskopf et al. 2015, p. 1060). This accords well with the research conducted by Zhuang et al. (2014) of the geoarchaeological evidence regarding greater control of the in-field water situation and intensifying farming practices. This research provides a detailed information on the complicated patterns of early water management and the physio-biological changes of rice caused by in-field ecological intervention of the prehistoric Lower Yangtze River. However, contextualising such water management practices and corresponding ecological changes within long-term cultural and environmental backgrounds at these early paddy sites remains challenging, mainly due to the lack of high-resolution chronological data from both in- and off-site contexts. The current lack of precise chronological data hinders any effective correlation between different kinds of proxy data collected from various contexts for palaeo-environmental and palaeo-ecological reconstructions. The Late Liangzhu period (4700–4300 paddy fields at Maoshan in the Lower Yangtze River were built on the foothills of the Maoshan Hill (48.8 m in elevation) (Ding et al. 2011; Zheng et al. 2014). In this intermediate landscape between the foothills and alluvial plain, the fields were next to a residential area on the slope, slightly higher up on the hill and at the same time connected to both natural and man-made rivers and creeks on the ground below. A geoarchaeological survey was carried out in 2011, during which many soil samples were collected. Our high-resolution palaeo-ecological data, supported by 14C and optically stimulated luminescence (OSL) dates, provides key information towards a better understanding of rice farming, water management and environmental change at the Maoshan site. We will present this data and discuss its significance, particularly focusing on the following aspects: (1) chronology of the construction, use and abandonment of the paddy fields; (2) the vegetation history of the paddy fields and surrounding areas; and (3) long-term fluctuations of the hydrological regimes in the fields resulting from both water management practices and regional alluvial processes. The Hangzhou Bay is in a tectonically stable area, with only minor subsidence during the Holocene. The Holocene sea-level fluctuations are the main factor influencing regional hydrology. After the steady increase from the beginning of the Holocene, the sea-level reached to c. − 2.5 m of the present level at around 7000–6500 cal. bp. Between 7000/6500 and 4200/4000 cal. bp, sea levels remained stable, with several centennial, minor changes. The rise of sea levels slowly increased between c.4000 and 3000 cal. bp, reaching the present level at the end of this period (Yang and Xie 1984; Feng and Wang 1986; Chen and Stanley 1998; Zong 2004). The Holocene sedimentation process in the Linping area (Fig. 1) is dominated by alluvial activities, with localised colluvial processes. Typical Holocene sedimentation sequences are dominated by light yellowish silty clay, with abundant iron-manganese nodules. At some locations, this yellowish silty clay either overlies on top of, or is covered by, light greyish silty clay whose light colour was caused by iron depletion under reducing conditions. This indicates that these locations were on low topography and subject to long inundations. The Middle to Late Holocene climate in the Yangtze Delta and nearby regions was humid and wet as consistently shown by several pollen and geochemical studies (Atahan et al. 2008; Tao et al. 2006; Yi et al. 2003; Yu et al. 2000). This climate condition promoted the expansion of ‘subtropical evergreen-deciduous broadleaved forests’ (Yi et al. 2003) between c. 7600 and 4800 cal. bp in the Yangtze Delta. These sub-tropical arboreal species grew on the mountains and hillslopes, including Cyclobalanopsis, Castanopsis/Lithocarpus, Castanea, along with many other species, whilst in the low-relief areas or wetlands, aquatic plants such as Trapa, Euryale, Oryza rufipogon, Typha, Cyperaceae and other hydrophilic species, flourished (Qin et al. 2010; Yi et al. 2003). The Liangzhu culture (5300–4300 cal. bp) is one of the most developed Neolithic cultures in prehistoric China. The densely-populated Liangzhu site complex, possessed a large-sized urban centre with earthen walls, palatial buildings and elite burials with elaborately carved jade items (Qin 2013), as well as a recently discovered and excavated hydraulic enterprise 20 km to the northeast of the Liangzhu centre (Liu et al. 2017; Liu and Renfrew 2018). Around 20 Liangzhu period sites have been found in the Linping area, forming a sub-centre in the outskirt of the Liangzhu site complex. The Maoshan site is one of the sites in the Linping sub-centre that was excavated in 2009–2011. The site was occupied during the Late Majiabang and Songze period (c. 6500–5300 cal. bp), before the Liangzhu period paddy fields were constructed. The Majiabang period archaeological features include house foundations, burials, a large number of pits and wells, all concentrated on the hillslope of the Mountain Hill (Zhuang et al. 2014; Ding et al. 2011). By the Liangzhu period, houses and burials were continuously built on the hillslope. At the same time, paddy fields were built in the intermediate area between the hillslope and the low-lying alluvial plain. Two phases of paddy fields have been excavated to date. Twenty-six early-phase (c. 4900–4700 bp) paddy fields have been excavated and were found to have been directly built on top of mid-Holocene alluvial sediments. These fields were small, from 1 to 2 m2 to a maximum of 40 m2, and irregular in shape. Wells were dug in the fields, which were connected to a creek through small ditched outlets. In contrast, the late-phase paddy fields were built on top of light yellowish alluvial materials, covering the early-phase fields. A dramatic increase in size occurred in the late-phase fields. Separated by narrow pathways in a north-southerly direction, the fields were 1000 m2 in size, with some reaching nearly 2000 m2. The entire fields measured approximately 5.5 ha by this phase. A new creek was dug to the north of the field, along with other water management facilities such as ditches and wells. These pronounced changes in the scale and structure of the fields from the early to late phase were closely related to changes in farming and water management practices. The stratigraphy under examination below was located at the edge of the paddy fields close to the residential area on the foothill. The sedimentation process at this location was influenced by farming activities in the fields and alluvial and colluvial processes which brought in sediments from the low-lying areas and hillslopes. From the top to bottom, the stratigraphy is divided into five main units: (1) topsoil (layer 1); (2) Late-Holocene flooding deposits (layers 2–5,); (3) peat-like sediments (layers 6–9) containing the Liangzhu period and succeeding Guangfulin period (c. 4100–3900 bp, cf. Zhai 2006; Ding et al. 2011) and associated cultural remains; (4) greyish alluvial deposits (layer 10); and (5) dark alluvial deposits (layers 11–12), rich in organic matter and containing sandy lens (Table 1). Topsoil, brownish silty clay with abundant iron-manganese nodules resulting from repeated wet-dry alternations. Light greyish silty clay, embedded with yellowish iron nodules and hard horizontal laminae. Dark brownish silty clay, abundant iron nodules in the upper part, and reduced number of iron nodules in the middle and lower sections. Brownish silty clay, containing the most abundant iron nodules amongst the upper 5 units of the profile. In the middle part of this unit, there are also abundant manganese nodules. There are 1–6-cm-thick dark greyish clay laminae at the bottom of this unit. Organic-rich darkish clay, at the top there are thin laminae of plant ash with some Guangfulin-period pottery sherds. Dark greyish silty clay, with abundant vertically situated ironised plant roots; some Late Liangzhu period pottery sherds are also present. Dark greyish silty clay, with abundant vertically situated ironised plant roots; there are also dark, organic rich laminae in the middle-lower part of this unit. Light greyish silty clay, with vertically situated, ironised plant roots; some pottery sherds present. Dark greyish silty clay, a 3-cm-thick sandy layer embedded in the middle part. Light greyish to brownish silty clay. Samples were taken from the different layers for OSL dating, 14-C dating, particle size distribution, pollen, diatom and geochemical analyses. The methods are briefly summarised below. In the field, five OSL dating samples were collected by using metal tubes (c. 20 cm long) sealed with aluminium foil to prevent exposure to sunlight. Pre-treatment were conducted at the OSL dating laboratory at the School of Archaeology and Museology, Peking University. In the dark room, approximate 100 g of sediments was grounded and sieved. First, 30% HCL and 30% H2O2 were added to 20 μm of this ground and sieved sediment to remove the carbonates and organic matter and then H2SiF6 (30%) was added to obtain fine-grained quartz. The measurements were performed using an OSL reader following the standard single-aliquot technique described by Duller et al. (2003). Water saturation was not measured in the field; an average 15% saturation rate was adopted for all samples. U, Th and K contents were measured at the Institute of Atomic Energy of China. Four samples were collected for AMS 14C dating. The samples were processed at the pre-treatment laboratory at the School of Archaeology and Museology and dated by the School of Physics, Peking University. OxCal v3.10 was used to calibrate the dates using the IntCal04 curve. Sixty-three pollen samples were processed at the Laboratory for Earth Surface Processes, College of Urban and Environmental Sciences at Peking University, using the standard hydrofluoric acid (HF) method (Berglund and Ralska-Jasiewiczowa 1986.). One gram of the sediment was dried and mixed with one Lycopodium spore. Ten per cent HCL was slowly added to remove the carbonates. HF (40%) was added to the washed sediments in a tube that was placed in a boiling water bath until the reaction stopped. HCL (36%) was added at this stage to remove the silicates. The mounted slides were examined under a microscope, with percentages of pollen species counted. Diatom samples from layers 4, 5 and 10 were processed at the Department of Earth Sciences, University of Hong Kong. Diatom processing followed the procedures described by Palmer and Abbott (1986). Samples (1–3 g) were dissolved in 20% H2O2 in hot water bath for 24 h. Several drops of concentrated solutions were mounted to cover slips with 10 drops of distilled water. The dried cover slips were placed onto a glass slide using Zrax. The species were identified based on Vos and Wolf (1993) and others (Round et al. 2007; Zong and Sawai 2015). Phytoliths mounted on the same slides as diatoms were also identified and counted. One hundred and fifteen samples were analysed for particle size distribution using the Malvern Mastersizer 2000 laser particle sizer, following the procedures described by Steve Boreham from the Department of Geography, University of Cambridge (https://www.geog.cam.ac.uk/facilities/laboratories/techniques/psd.html). Geochemical analysis was conducted at the HR-ICP-MS laboratory, Peking University. A bulk sample of 0.4 g was mixed with 4 g of Li2B4O7 and LiBO2 in a crucible, which was heated in a fusion machine to 700 °C, followed by 1080 °C. The sample was then shaken for 5 min whilst gradually adding 40 mg of NH4l. The major element compositions of the sediments were determined on an X-ray fluorescence spectrometer. Trace element compositions were measured by running a HR-ICP-MS analysis on an Agilent 7500 mass spectrometer. The four 14C dates from layers 9–6 show a consistent chronological order from the bottom to the top of the profile, comparable with relative chronology reconstructed by the excavator based on pottery typology (Table 2; Fig. 2). The 14C dates of 4580–4340 cal. bp from MS-6 is older than the designated relative age of the Guangfulin culture, which falls between 4100 and 3900 bp (Ding et al. 2011). The 14C dates from the other three horizons correspond well to the established absolute and relative chronologies of the Liangzhu and the Late Majiabang-Songze period (Ding et al. 2011). Age reversals occurs in the OSL dates between the fifth to third yellowish silty clay layer (Table 3; Fig. 2). These OSL dates, however, fall into the broad time span of 4000–3200 bp, which is within the chronological framework for the widespread flooding event in the region. The other two OSL dates from the eleventh and twelfth layers are of Late Pleistocene ages, significantly older than the other dates. This suggests that the building up process of the alluviums had begun by the Late Pleistocene. Thus, these dates, combined with the stratigraphic order and cultural characteristics of artefacts discovered during the excavation, support our chronological division of the sedimentary sequence described in Table 1. Layers 12–10 represent the Early-Middle Holocene alluvial sequence preceding the use of the paddy fields. Layers 9–6 correspond to the use of the paddy fields, which include an early and later phase (corresponding to the Middle-to-Late Liangzhu phase and Late Liangzhu phase). Layers 5–2 were deposited during the flooding periods after the field was abandoned. This reconstruction provides a useful framework for our discussion of the pollen and other records (but see our further discussion below on ‘chronology’). The pollen densities of the 63 examined samples varied greatly. Several samples produced less than 100 pollen grains per slide, but the majority of the samples contained at least 300 pollen grains per slide, with several samples having more than 500 pollen grains per slide (Fig. 3). A large number of arboreal and herbaceous plants as well as ferns and algae were identified. Based on the changing percentages of arboreal, herbaceous and fern pollen, we can divide the pollen profile into three main zones. In zone 1 (2.66–1.92 m, layers 12–10, corresponding to Early-to-Middle Holocene alluvial sequence), the pollen assemblage contained about 20% tree and shrub species, with low percentages of fern species. Evergreen species such as Quercus were dominant in the arboreal pollen, but pollen of Pinus and deciduous Quercus and Ulmus was also present. Percentages of herbaceous species were high, represented by Gramineae, Cyperaceae and Typha, with Artemisia, Chenopodiaceae and Cruciferae also present. In the second zone (1.92–1.31 m, layers 9–6, corresponding to the Middle-to-Late Liangzhu phase and Late Liangzhu phase), the percentages of tree and shrub species again accounted for around 20% in the early stage, this slightly decreased to around 10–15% but gradually increased to 25–30% with more evergreen Quercus in the later stage. Fern species included Monolites and Trilites had low percentages in the early stage but increased significantly in the later stage. Gramineous, Cyperaceae and Typha species continued to be abundant with a significant increase of these three species, along with the addition of Artemisia and Chenopodiaceae species to the assemblage towards the top of this unit. Gramineae species decreased whilst Typha species gradually increased in the later stage. In zone 3 (1.31–0.33 m, layers 5–2, corresponding to post-paddy field flooding deposits), Pinus pollen grains became abundant, whilst the percentage of evergreen Quercus gradually dropped. In the later stage, an important change was the increase of both Alnus and Betula species in the pollen assemblage along with the high percentages of fern species included Monolites and increasingly Trilites. The three common herbaceous species, Gramineae, Cyperaceae and Typha, experienced a significant drop in their abundance, which is in contrast with the steady increase of Chenopodiaceae and Artemisia species first and later also of Cuciferae species. These changes in the pollen assemblages in the upper part of the profile seem to correspond to a gradually cooler and drier regional climate regime. The diatom results are presented in Fig. 4. It should be mentioned that as well as diatom species, reed phytoliths were also counted in these slides. A large number of reed phytoliths and freshwater diatom species were found in the tenth layer (1.92–2.3 m). The latter include Eunotia lunaris, Gomphonema parvulum, Hantzschia amphioxys, Pinnularia microstauron and Synedra unla. Slides from the sixth to ninth layers (1.31–1.92 m, corresponding to the Middle-to-Late Liangzhu phase and Late Liangzhu phase) contain some reed phytoliths, but diatoms were not found. For the fifth and fourth layers (0.8–1.31 m), only a small amount of reed phytoliths were present, and some brackish water diatom species, such as Coscinodiscus blandus and Actinocyclus sp., can be seen. This drastic change from predominant freshwater diatom species at the bottom to mainly brackish water species at the top is closely related to regional and local hydrological changes, which is discussed further below. The detailed results of the particle size distributions and geochemical analyses are shown in Figs. 5 and 6. These results provide important information regarding the sedimentary and post-depositional processes. In 266-230 cm (layers 12–11), fine-sized particles (silt and clay) contributed the most to the sedimentation, along with a very low percentage of coarse particles. The average values for Al2O3/Na2O, K2O/Na2O, CaO/MgO and Rb/Sr ratios were 17.2, 1.9, 0.7 and 1.5, respectively (Fig. 6), whilst the rare element compositions were higher than the average for the whole profile. The high abundance of Al2O3 and Fe2O3 might be due to the fact that they are not easily removable and thus resistant to the in situ weathering process. Correspondingly, the relatively low percentages of CaO and MgO might be due to their high mobility in predominantly weathering conditions. In 230–192 cm (layers 10), there was an obvious increase in coarse sand-sized particles in the sediments, especially from the sandy layers embedded in layer 10. The Al2O3/Na2O, K2O/Na2O and Rb/Sr values (14, 1.7, and 0.9, respectively) slightly decreased and correspondingly the CaO/MgO ratio saw a slight increase (0.8). Rare element compositions also showed a pronounced decrease. Several changes, particularly the contributions of coarse particles, can be observed in 192–131 cm (layers 9–6, corresponding to the Middle-to-Late Liangzhu phase and Late Liangzhu phase). The Rb/Sr was stable (0.9), but ratios of Al2O3/Na2O and K2O/Na2O, and CaO/MgO continued to show reversals in trends, with the latter having a higher value. Similarly, rare element compositions also experienced obvious fluctuations. The Al2O3 and T-Fe2O3 values showed a pronounced increase in layer 6 (c.131 cm, corresponding to the Guangfulin cultural phase). Similar changes can be seen for both CaO and MgO values. This stage was dominated by continuous deposition of sediments with weak in situ weathering or post-depositional processes. This means that these values reflect those of the exogenous sediments, including the possible contribution from the marine sediments, caused by the high CaO value as calcium is more readily precipitated in seawater (Zhong and Mucci 1989). We should also mention that the SiO2 value experienced a dramatic decrease at the same level. This might be caused by the decrease of coarse particles of quartz (Fig. 6) as SiO2 is mainly composed of quartz rather than from fine-sized particles such as clay. The sedimentary process in 131–111 cm (layer 5) was characterised by the significant increase of fine-sized particles. The reversal of trends can be seen in the ratios of Al2O3/Na2O, K2O/Na2O, Rb/Sr and CaO/MgO: the former three increased (19, 3.6 and 1.5, respectively) whilst the last one decreased (0.4). The rare element compositions reached a peak at this stage. From 111 to 80 (layer 4) and 80 to 33 cm (layers 3–2), percentages of clay particles dropped significantly and percentages of silt and coarser particles increased to as high as 85%, indicative of fundamental shifts in sedimentary regimes. Coupled with these changes were the drastic changes in Al2O3/Na2O and K2O/Na2O ratios (6.1 and 1.2, respectively, in 111–80 cm (layer 4); and 6.2 and 1.2, respectively, in 80–33 cm (layers 3–2)), whilst the values of CaO/MgO and Rb/Sr ratios changed slightly (0.7 and 0.8, respectively, in 111–80 cm (layer 4); and 0.7 and 0.6, respectively, in 80–33 cm (layers 3–2)). Rare element compositions dropped to a very low level. Regarding other changes determined by the geochemical analyses, K2O and Na2O experienced a slight increase in the upper part of the profile. This increase may be related to the contribution from saline water. The 14C date of the peat layer was older than expected. This might be due to the intrinsic difficulties of dating peat sediments (Shore et al. 1995), as essentially the 14C dates are the mean results of organic matter (humic and fulvic acids) which is normally compacted after deposition. 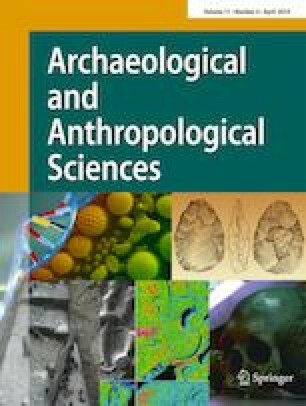 In addition, taphonomy might be responsible for this chronological discrepancy between the 14C dates and relative chronology derived from pottery typology. The pottery recovered from the peat sediment was most likely deposited on the peat horizon through scattered human activities. In other words, the peat horizon was deposited first, on top of which human activities took place. For the age reversals amongst the OSL dates of the light yellowish silty clay sediments, the reasons are equally complicated. As the deposition of these sediments are related to the post-Liangzhu period flooding events, there might be problem of impartial exposure to light before deposition, a common issue encountered in OSL dating of fluvial deposits. The reason for the OSL age in MS-5 (120 cm) being significantly younger than the overlying samples is because of its high dose rate (4.30 ± 0.15 Gy/ka). As to the transition from the peat horizon (layer 6, corresponding to the Guangfulin cultural phase) to the flooding deposits (layers 5–2), determined by 14-C and OSL dates, respectively, given the chronological gap, there might be depository hiatus between these two sedimentary events. As well as being compacted, parts of the peat-like sediments might be eroded away before the deposition of the yellowish silty clay. Despite all these issues, the combination of 14C and OSL dating techniques has helped to refine the chronology of the construction and use of the paddy fields at Maoshan, the deposition of the peat-like sediments and the flooding events that eventually marked the abandonment of the site. The initial occupation at the site began at around 5740 ± 140 cal. bp, lasting to until 5460 ± 130 cal. bp, corresponding to the Late Majiabang and Songze cultural period (6000–5300 BP, Nanjing Museum et al. 2016; Zhejiang Provincial Institute of Cultural Relics and Archaeology 2005). The middle-phase paddy fields (layer 7, corresponding to the Early-Late Liangzhu cultural phase) were built at around 4675 ± 145 cal. bp and continuously used until around 4000 cal. bp. This also means that the initial use of the paddy field (layer 9, corresponding to the Middle Liangzhu cultural phase) was earlier than 4600 cal. bp. Whilst it is clear that the flooding events directly related to the deposition of the yellowish silty clay deposits dates to around 4000 bp, our OSL dates demonstrate that these flooding events lasted for a substantial period of time. These new dates are significant as they help us understand the magnitude and duration of these floods. The effects of these flooding events and their implications to the mechanisms of societal responses should be reassessed in light of these new dates. The landscape around the site of Maoshan consist of several niches that had distinctive vegetative patterns: the Maoshan Hill, the residential area and the paddy fields and the wetlands. The microfossil plant remains we have discovered provide first-hand data to reconstruct local vegetation dynamics that were under the combined effects of long-term climatic/environmental and land use changes. The intrinsic taphonomical issues of pollen transportation and deposition often undermine the reliability of using pollen records to reconstruct past climate changes. However, our geochemical and particle size distribution (PSD) analyses provide supplementary information on local sedimentary processes and the changing sources of the sediments to refine our interpretation of the pollen records. On a temporal scale, pollen grains from zone 2 at Maoshan reflect local vegetation changes, whilst those from zones 1 and 3 of the profile are most closely related to regional vegetation changes as the sediments for these levels underwent long-distance transportation. In terms of the taxa, roughly speaking, the arboreal species provide information regarding the vegetative changes on the hills, hillslopes and alluvial plains, whilst the herbaceous, fern and algae species reflect the changing ecological and hydrological conditions in the field and the low-lying wetlands. The majority of the tree and shrub pollen belonged to evergreen and deciduous species such as Quercus, Betula, Ulmus and Pinus. Even though the abundance of Quercus pollen, for instance, changed over time, the fluctuations were not significant until the later stage of zone 2 when Quercus pollen became particularly abundant. This coincides with the peak of human activities at the site, so we cannot rule out the possibility that there was deliberate management of the forests on the hill or nearby the Maoshan site. In contrast, drastic changes in arboreal species in zone 3 are evident with increases and short-term fluctuations in Pinus, Almus, Betula and deciduous Quercus pollen. Even though all these pollen grains were very likely transported by the flood waters or surface runoff from elsewhere before they were re-deposited at the site, they reflect the regional vegetation changes caused by environmental and climatic oscillations, which were becoming cooler and drier. Such changes are corroborated by the increase in Artemisia pollen, and probably also Chenopodiaceae pollen as well, although many Chenopodiaceae species grow in both wet and dry conditions and therefore their implications to environmental changes should be treated with caution. Overall, the vegetation taxa became less diverse across the whole region before the onset of massive floods. This might be related to intensified agricultural activities and increasing deforestation in the region during the Late Liangzhu period (cf. Zheng et al. 2014). This vegetative pattern accords well with the geochemical results which showed gradually decreasing values of Al2O3/Na2O and Rb/Sr, which are indicative of the transition from warm and humid conditions to cooler and drier conditions. Whilst this change might be related to regional climate events (e.g. the so-called 4.2 ka bp event), a convincing link for these ecological changes in the field and the regional climate event has not been established yet. The K2O/Na2O and to a certain extent, the CaO/MgO values stayed roughly unchanged. These K2O/Na2O and CaO/Mgo values might reflect the geochemical properties inherited from the source sediments in residual forms rather than derived from post-depositional weathering. The spike in changes amongst the geochemical results occurred between c.130 and 120 cm, for instance, must be related to the process just described. However, caution should be taken for the above interpretation as without a detailed understanding of the chemical precipitation and biological uptake of the values of diagnostic elements (e.g. Rb and Sr), the possibility that these geochemical results were related to post-depositional changes cannot be entirely ruled out (cf. Zeng et al. 2011 and references therein). Gramineae taxa were abundant in the pollen zones 1–2, with evident increases from the middle stage to the later stage of zone 2. Such increases coincided with rice farming at the site. Some of the large-sized (> 40 μm) pollen grains might belong to the cultivated crops and related weeds. Reed phytoliths remained abundant from later stage of zones 1 to 2. This, on the one hand, suggests that reeds are less sensitive to hydrological changes (e.g. from freshwater to brackish water) than other plants, and on the other hand, also implies that the ecological system surrounding the fields was relatively stable. This might be a result of deliberate water management as discussed below. Our diatom results have provided unambiguous evidence for the shift from a freshwater dominant hydrological condition before and during the use of the paddy fields to one that was strongly affected by brackish water after the abandonment of the fields. The latter was caused by a relative sea-level rise in the region, as many studies have demonstrated (Zong 2004; Zong et al. 2011). Whilst these diatom results are a useful indication of the regional hydrological situation, the other proxy data we have obtained has provided more detailed information regarding the reconstruction of in-field water conditions that were influenced by both regional hydrological conditions and the changing water management practices. The rising water level was coupled with several short-term events of high-energy surface runoff during the use of the paddy fields. From 230-cm-depth upwards, we can observe a continuous increase of coarse particles in the sediments, indicative of more frequent surface runoff in and out of the fields. The embedded sandy lens, indeed, point to a strong, albeit short term, flushing in of sediments into the fields. Given that the use of artificial and natural ditches and creeks located at the both ends of the fields would have effectively absorbed eroded materials from the upland, we suggest that these coarse fractions in the sediments were flushed into the fields through irrigation activities. This sedimentary change is compatible with the increase of CaO, MgO, K2O and Na2O values as discussed above from layers 9–6 (corresponding to the Middle-to-Late Liangzhu phase and Late Liangzhu phase) as the artificial control of the hydrological conditions in the field effectively stopped the leaching of these chemical elements (also cf. Driese and Medaris 2008; Vepraskas and Faulkner 2001). In addition, the increasing coarse-sized particles might be related to sediments being flushed in the field during irrigation. The overall pollen grain density started to drop from layer 9 (corresponding to the Middle Liangzhu cultural phase) upwards whilst the percentages of the Gramineae pollen grains experienced a steady increase. These contrasting trends indicate that weeding might have been practiced by the Maoshan rice farmers. Of great significance to our understanding of water management practices is the changing curve of Typha pollen. Typha is a wet-loving species commonly growing in wetlands or similar habitats such as paddy fields subject to frequent and/or prolonged water saturation (Keddy 2010; Li et al. 2010). Typha pollen remained abundant after the initial wetlands were converted to rice farming (corresponding to zone 1 to the lower part of zone 2), with frequent fluctuations. A noticeable increase started to occur at the middle stage of zone 2, corresponding to the late phase of the paddy fields, before it began to decrease in the flooding deposits. This indicates a clear return to a wetter condition during the late phase of the use of the paddy field. The abundance of Cyperaceae species, another type of plants closely related to wet habitats, shows a similar trend, but it did not witness a significant increase in the end of zone 2. Both curves suggest that the water level did continue to rise, with frequent fluctuations during the use of the paddy field. Related to these trends is the change in the overall pollen grain density, which experienced a drop. Our observation of hydrological changes is comparable with the one made by Weisskopf et al. (2015), based upon their examination of the phytolith assemblage of rice and weeds collected from the Maoshan paddy fields. Using their established fixed and sensitive morphotypes as the respective ecological indicators of dry and wet fields, they found that the return to a wetter condition at Maoshan was marked by a high percentage of sensitive morphotypes of phytoliths. Weisskopf et al.’s samples were collected from both ‘river edge’ and ‘paddy fields’, whereas samples for our present research were from a mainly complete sequence on the edge of the fields. Whilst these two sets of samples, from Weisskopf et al. and this present paper, might reflect the spatial-temporal variations of the vegetation dynamics at the site, the general trend of rising water in the region, it is the return to wetter conditions in the fields detected by both studies that is the most convincing piece of evidence. However, our records also present evidence of vegetation changes caused by frequent wet-dry alternations in the fields throughout the different phases, compared with relatively stable ecological conditions in the wetlands surrounding the fields (e.g. reeds). We would suggest that this high frequency of in-field vegetation changes is closely related to intensifying water management for rice farming in the transition from the early to late phase use of the paddy fields. The latter is also supported by the micromorphological study of the cultivated soils conducted by the aforementioned research by Zhuang et al. (2014) at the site. This intensifying water management practice, however, became unsustainable as the water level rose to a high level, marking the abandonment of the paddy fields at Maoshan during the Guangfulin period. The latter is also confirmed by the increasing pollen grain density from layer 6 (corresponding to the Guangfulin cultural phase) with abundant Gramineae, Typha and other related species, indicating that the fields were colonised by hydrophilic weedy plants and related species with the rising water table. In conclusion, our geoarchaeological and paleo-ecological investigation at Maoshan offers detailed information for an in-depth understanding of the palaeo-hydrological and ecological changes in the paddy fields on both local and regional scales, permitting a robust understanding of the development of rice farming and water management at the site, which was closely related to environmental changes in the region. The Maoshan site was first occupied during the Late Majiabang and Songze period (c. 6000–5300 cal. bp). The initial rice farming began during the Middle Liangzhu period, followed by an expansion characterised by its impressive increase in scale of the size of the fields and intensified water management practices. This intensification process of rice farming coincided with a favourable climatic regime in the region, which is well demonstrated in our micro-fossil plant records and other published data. More importantly, the regional water table, which was mainly determined by the sea level and alluvial hydrology, during this period of rice farming expansion remained relatively low, compared with the succeeding period, and also stable. This facilitated successful water management by the Maoshan rice farmers who also built irrigation facilities such as ditches and creeks. Our pollen records and geochemical-physical analyses have proved to be a useful way to explore these irrigation practices, including some sensitive plant species such as Typha and geophysical-chemical indicators such as coarse-sized particles and values of certain chemical elements. The intensifying rice farming and water management was accompanied with a gradual return to a wet hydrological condition at the paddy field site and in the region. Whilst the climate experienced a shift from warm and wet conditions during the Middle to Late Liangzhu period to a relatively drier and cooler situation during the Guangfulin period, the regional water table also rose to a very high level. This change had a devastating impact on the rice farming and water management at Maoshan and beyond, marking the eventual abandonment of the paddy fields at the site. The Maoshan paddy field site present a good opportunity to examine the combined effects of regional sea-level rise, hydrological change in the major rivers and water bodies (e.g. the Qiantang River and the Taihu Lake), and possible increased sedimentation inputs to the rivers and lakes on the development of prehistoric rice farming and water management in the Lower Yangtze River. Our research also offers valuable methodological implications and theoretic significance to the heated debate on the wet-dry narratives of early rice farming across the monsoon areas of Asia (Bray 1994; Kirch 1994; Weisskopf et al. 2015). Whilst it is generally agreed that the increasing investment in the construction of hydro-infrastructures for irrigation has a profound social impact on rice farming societies (cf. Fuller and Qin 2009), the trajectory to intensification of rice farming is certainly not a linear one and does not share same paths in different rice farming regions. Local ecological and hydrological conditions, technologies and other factors all contribute to the evolution of rice farming systems. In some regions, dry farming systems also persist. To further unpack such a dichotomy, we need to focus more on the palaeo-ecology of early rice farming in wider paleo-environmental contexts. This research is funded by National Social Science Fund of China (11&ZD183), National Natural Science Foundation of China (41171006), National Key Technology Research and Development Program of the Ministry of Science and Technology of China (2013BAK08B02) and National Natural Science Foundation of China (41701220).